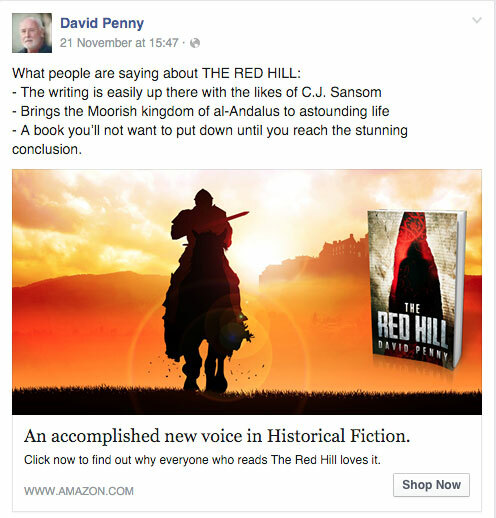 British indie author David Penny shares a case study of his own Facebook advertising campaign, which he’s using to promote the first in his historical crime thriller series, The Red Hill, set in medieval Moorish Spain. There’s a saying only 50% of marketing works—but nobody knows which 50%. Having spent many years in business I can vouch for this—even to the extent of experiencing the entire 50% that doesn’t work! So when it comes to my writing I’ve grown cautious. Doubly cautious when it means spending money, and what I earn from my books is meagre at best. I warn you, I’m no bestseller. Sometimes I’m barely a seller at all. So when I saw recommendations for Mark Dawson’s Facebook advertising course I approached it like a mongoose creeping up on a cobra. Except Mark didn’t bite – I did. I should say there are many other courses out there, as well as free training resources, but something about Mark’s approach resonated with me. He didn’t promise I would become a bestseller overnight. He didn’t even promise his approach would work, which was refreshing. When I started the course in October 2015 I wasn’t an ideal subject. I don’t have many books in a series, although I do have a series, and I don’t have a box set. What I did have was two books which have garnered a few good reviews, but those books were bumping along around the 150,000 sales rank in both the UK and US. That’s on a good day. On bad days it’s closer to 250,000. My initial concern was whether I was too late into the game. There were so many success stories around I feared the market might be saturated. But no, it appears that’s not the case. I started by listening to the course introduction, then skipped the second module and dived straight into the Sales section. I was impatient. I wanted results and I wanted them now. So—what has my experience been? Well, like I said, my UK ranking before I started was in the hundred thousands for The Red Hill, a little lower for Breaker of Bones. 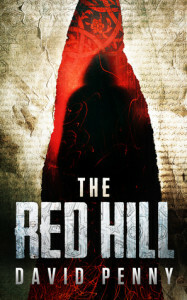 After running ads for a month The Red Hill currently stands at position 18,080—just outside the top 200 in Mystery, Crime and Thrillers > Historical > Mystery. Along the way I’ve made some mistakes, but I’ve also done a few things right. Not understanding the way people buy. I tried to be clever, thinking like a writer. People make up their minds whether to click on your ad in milliseconds. Clever doesn’t cut it in that time period. Being too British—my first ads were far too polite, and I didn’t push myself enough. Only when I broke through that reserved mindset did my ads begin to resonate with the public. Don’t try to explain your book. Instead, sell it. As I said before, people make a decision in an instant. If an image grabs them and the words don’t put them off, they might click on your ad. Too many words and they’ve already moved on. Targeting specific times of day helps. Currently I only show my ads between 6pm to 10pm, with some extra slots Saturday/Sunday morning, and I start earlier in the evening on those days too. I base this on my own habits. I surf over breakfast at the weekends, and can often be found swiping and pinching in the evening in front of the TV. Well… this did. I tried several things, but the ad below appears to catch people’s attention. Interestingly, when I added the word FABULOUS and 5 yellow stars, my click through rate fell. This version gets social proof with likes and comments, and it sells books. Not millions, not even hundreds, but it sells enough books to pay for the advertising and a bit more. And notice the lack of British humility in the strapline of “An accomplished new voice”. It took me ages and two whiskies to get up the courage to write that line! DISCLAIMER: I have no direct connection with Mark Dawson, and paid full price for his course, which is currently closed for applications but opens up again in Spring 2016. In the meantime you can check out some of his free videos here. OVER TO YOU Have you had experiences, either good or bad, advertising on Facebook? If so ALLi would love to hear from you about them in the comments section below. I’ve spent a lot of my personal cash on Facebook Ads and have managed to do lots of wonderful things EXCEPT gain readers. So David, now I’m going for the kill. I’m straight-up sending my Ad to amazon to buy my eBook. I have adapted the principles from your Ad in this article and now I’m praying for a miracle. I will keep you posted if I get anywhere new with it. Thank you for the advice! Good luck! David, what did you use to make your ad? And any tips on going about it? These are some helpful thoughts on FB ads for authors and on the courses that say they’ll help you turn yourself into a best-selling author. I’ve been watching the current promotions for Mark Dawson’s course and a similar course by Nick Stephenson these past few weeks. 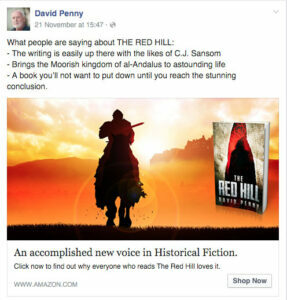 What’s struck me about both is that FB advertising for authors, namely fiction authors, is not about selling your books. It’s an email list building strategy. You advertise on FB to get subscribers. You then cultivate these subscribers, hoping to turn them into readers of your future books by getting them interested in your writing, characters, stories, etc. through free and perhaps low cost books. In other words, FB ads are a way of “buying” subscribers. An investment. One in which you’re hoping to create future readers. Of course, it all hangs on whether your books (stories) are well-written and grip people enough to make them want to read more of your books. And buy them. This was so helpful David – thank you for sharing your experience – I’ve just launched my first ad campaign with Facebook – taking on all your advice! fingers crossed! Hi David, some very good advice, I suppose I come across as being too British, well I do have links to the artist JMW Turner and Queen Victoria’s surgeon Sir Percivall Pott, I am the author of a family history book called TURNER TREES by KEITH POTT TURNER and I hope to be a “Revolutionary Player” in the publishing world. Thanks for such an informative post, David, and being so generous in giving us your personal experience. I signed up for Mark’s course in May 2015 and although my several attempts at FB ads didn’t achieve my goals I learned so much about self publishing in general through Mark’s course and his FB author page. This new understanding led to my changing my overall strategy so that with some combined promotions I’m now averaging 100 sales a day, as of the past two months, compared with way less than 100 in an entire month, prior to that. The boost led to my finishing a third book in my series and I think that with three books I’m now ready to give FB ads a try once again. 100 sales a day sounds amazing! What promotions worked best for you? I’m just getting started and would appreciate any advice you are willing to share. Hi Cathy – as with all these things what works changes all the time. Initially, Facebooks ads worked well for me but, although still making a return on these it is less than it was a year ago. Amazon ads are beginning to pick up some traction and I also use these as well and they are improving all the time. Next year it will no doubt be something else. My advice is to try one thing at a time for a short time to see if it works for you. If not move on to something else. Is an FB ad the same as a Post Boost? They are not the same. Boost posts aren’t as effective. Great article David. Really good info. You should add a follow-up. I’ll now try to phrase the text in a way closer to yours. I’m frozen in place trying to get all of my “ducks in a row” before marketing on Facebook. I’ve listened to Mark Dawson’s course and am ready to go — the the Landing Page stops me every time. Where did you, David, have your page designed? Thanks. Thanks David. Great insights there into your own experience. To those who’re new to Facebook advertising in particular, this link (below) may come in handy. It’s a blog featuring a comprehensive guide to using Facebook ads. I put this together with my brother who’s been working in digital marketing for about ten years. Thanks, David. There’s nothing like “real life” experience with ads. Have you ever tried Amazon ads? Hi Sally – not tried Amazon ads yet. Most of the feedback I see seems to indicate they’re not as effective. I am doing Amazon ads now. They are slow to produce sales, but I haven’t spent much so far. It’s a game of trial and error, just like FB ads, but cheaper. I’ve only sold 3 books with AZ ads so far (in a month). I sold more with a discount campaign to my list of readers. But, from what I have heard over and over, the “list” is king. it’s golden. I’m trying to balance my marketing efforts between sales and list building via a free book. It’s a tough business. Good luck. Thank you so much for sharing your successful ad, as well as variations that did not work — this is hugely helpful, way more so than a list of tips. 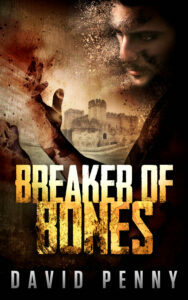 You may have convinced me to try this with my first novel release in March! Good luck with your novel in March, E.J. LOVED this! For one thing, it spoke to me because I’ve tried “polite” advertising before, and yes, it’s a dud. Second, the opposite end doesn’t work either (5 stars! FABULOUS!). That reeks of unprofessionalism and looks like everyone else’s ad. What’s shocking is so many people think that will work. Just tell me what the book is ABOUT. I too went the whole nine yards with the course, David, and had a tiny amount of success. But while I got considerably more sign-ups to my email list, I just couldn’t get a selling ad to work. 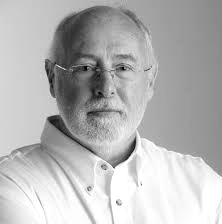 I don’t know whether it was because I write in a very large and competitive genre – crime – or because I didn’t have the organised mind-set needed to do split testing and work on ROI and keep spreadsheets etc … in the end I spent a lot of money and still sell only 80-100 books a month. I really thought and hoped it would work for me but I need to sit back, build up some capital, then try again with a more structured approach. Well done for your success, though! To be honest, Keith, I think I was just lucky to hit on a formula that worked early on in the process. David, I loved this post! Not only does it come at a perfect time ( I,too, am finishing up an historical series and will soon be promoting it) but your sense of humour is marvelous! Thanks for providing such specific information on your FB ad experience. Cheers, from across the Pond! Thanks Dianne – and good luck with your series. Nice share and congrats on success! I do have one thing to ask/add. I’ve been designing some Facebook ads for authors and in my experience of working with them and testing the ad images, the best performers were images with no book cover at all. Instead, the images where related to the genre but it’s better they are with no cover and they look bold/vibrant and attract the eye instead of showing cover. That is weird but at the same time makes some sense because the image is just the attraction and what sells is the text. Have you tried any images without book cover on your ad testing? Hi Adrijus – no, haven’t tried removing the book cover yet. Maybe that should be next on the list to do and test which performs the best. Thanks for the heads-up on that. Sure thing! It’s been a proven thing for multiple authors so had to share. Hope your results will improve and book hits tops! When you say, “Best Performers”, do mean Click Through Rate or Sales? If you can track both, track both and see which ad works best. Sometimes ad with best CTR doesn’t produce as much sales as lower CTR ad. Weird, but happens. Just wanted to add my thanks – useful info to have. I wish you every success with your books too. Love the comment about being too British. Thanks for sharing David. I meant over here! I did! Very interesting and great points. Did you target your audience in any way? Yes, Kristin, and the targeting was fairly specific. What i did discover was if I aimed for a large audience, say Historical Fiction, the target pool was huge, somewhere over 66 million in the US, but he csts per click was high. My best results have come from selecting a small, specific audience such as 3 or 4 authors with a total reach around 50,000. Onviously a smaller pool to fish in, and the fish will run out sooner, but at the moment it’s working OK for me. Very helpful post! Guess I’ll have to try a couple of whiskies. On second thoughts, in my case it will have to be Cretan raki! Thank you for this. Interesting and enlightening. I too signed up for Mark Dawson’s Facebook Ads course. Unfortunately, I began advertising in December and was pretty soon lost in all the Christmas advertising clutter. But I plan to keep experimenting until I find the right targeting and wording mix for my different books. Thanks for the examples you gave–very helpful! Interestinglt, Pamela, I found all the complaints about Christmas being a tough time barely affected me. Perhaps because my target audience is different to most of Mark’s course members. My results in December were the best to date (I have done Mark’s brilliant course) and January 2016 even better to date. FB ads work if you can get it right. They don’t always work though so you have to a LOT of testing. Very helpful post. Certainly resonates with me. Thanks to David and ALLI. Thanks, David! I’m going to give FB ads a try again using your tips. What a useful post! Many thanks to David for the tips and hints.